We are back for our new terms of African Drumming Courses, starting Wednesday 26th September. We have beginner and intermediate levels and all instruments are provided. New Term Dates: September 26th, October 3rd, 10th, 17th and 24th. Time – 8.15 – 9.30pm Cost – 75 euro. 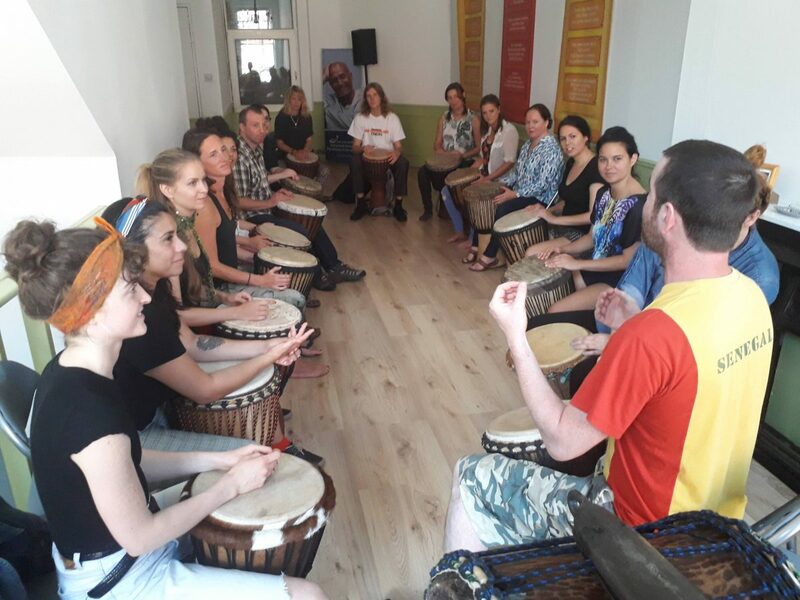 Paul McElhatton has been studying West African drumming for 20 years, including nearly 2 years of full time study in Mali, Burkina Faso, Gambia and Senegal, West Africa. He has studied with with exceptional Master drummers including Drissa Kone (Mali), Tomas Camara (Ballet Djoliba, Guinea), Mamady Keita (Guinea), Babara Bangoura (Guinea). He is the founder of Afro-Eire and West African groups Fakoli and Manden Express, and is a regular contributor on the Irish African music scene, including several performances with Ivorian djembe vituoso Sidiki Dembele. We are delighted to announce our first ever residential kamele n’goni weekend. Situated in a beautiful old house in Laragh, Co Wicklow just a few minutes drive from the lakes of Glengalough. So this is how it works. We would start the day with group warm ups and the basic bones of the groove for that session, afterwards everyone can find a little corner to play and I will go around everyone spending time adding to the rhythm individually.. So when you have one part down, I will come back with improvisations for you. Then we can all get together again in the evening to play. Please take a look at some information on Kamele n’goni here and check out some of our free Kamele n’goni lessons so you may know what to expect. Paul McElhatton has been studying West African music for over 18 years and kamele n’goni for 12 years. He studied Kamele n’goni in Burkina Faso with masters Ibrahama Sanou and Drissa Diarra. Since then he has gone on to form and perform with groups including Manden Express and the Sidiki Dembele Sextet. Cost – 160euro including bed and tuition. https://www.afroeire.com/wp-content/uploads/2017/10/ae_logo3-150x150.jpg 0 0 AfroEire https://www.afroeire.com/wp-content/uploads/2017/10/ae_logo3-150x150.jpg AfroEire2018-07-17 12:05:222018-11-26 15:24:20Kamele n'goni weekend - August 17th to 19th 2018.